If you own a Brother combination sewing and embroidery machine a bobbin case with a green marking covering the tension screw has been installed in the machine at the factory. On recent models you will have been supplied with an alternate bobbin case with pink marking or no marking provided as an accessory. The alternative bobbin case is tensioned tighter and is also adjustable, enabling you to achieve correct tension for the threads you are using. When using the #60 embroidery bobbin thread provided, please be sure to choose the green marked bobbin case when performing utility stitch sewing and embroidery functions. When in the embroidery function mode, if you use substitute embroidery bobbin threads (other than what is accompanied with your machine #60) then the alternative bobbin case should be used for adjustment to tension. See our separate help guide about understanding Bobbin Fill. For embroidery-only models you have just the alternative bobbin case fitted which can be adjusted. Golden Rule: If it isn’t broken – don’t fix it! The following information is supplied to help you if your tension is causing you problems. It doesn’t matter if you don’t have perfect tension as long as the results you achieve are good enough for you. Important Note: Safety First – SWITCH OFF the machine (or put it into Safety Mode if you have this feature) before undertaking any removal of covers or putting your fingers under the needle bar or inside the machine etc. 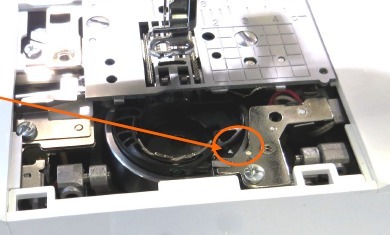 To remove the bobbin case on most Brother machines you do not need to undo the screws securing the needle plate. Just slide the L-shaped plastic cover forwards and then take out the bobbin case. If you do remove the needle plate screws at any time always replace the needle plate first and securely fasten down BEFORE replacing the bobbin case. Failure to do it in this order can result in the machine becoming locked-up. When replacing the bobbin case align the two markings if you have them, otherwise just replace with the adjusting screw facing the front, ensuring the bobbin case fits snugly in the race. You should be able to turn the balance wheel freely and the bobbin case shouldn’t pop-up. 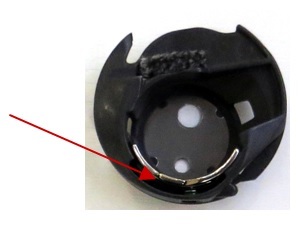 Note: We recommend that you don’t adjust the tension on the factory-set bobbin case where the screw is held in place with green screw sealant. Once the seal is broken the screw will move from any setting you have adjusted to because it’s no longer secure. Make your adjustments with the thread removed from the bobbin case. The alternative (adjustable) bobbin case may have pink sealant or no sealant on the tension adjustment screw. Don’t touch the cross-headed screw on the bobbin case. Important note before making adjustments: If you are suddenly experiencing a lot of top thread locking up below the needle plate then this is likely to be a top thread tension issue where there is contamination in the upper tension unit or a damaged bobbin case (sometimes caused by a jam or needle breakage) or the bobbin case has been inserted incorrectly. These issues are covered in a separate help notice Know your top thread tension. If your bobbin tension has suddenly become loose it may be because contamination has lodged itself under the tension spring. Before adjusting thoroughly clean the bobbin case and then insert a pin gently into the spring to hold it open and blow hard, or gently dig around with the pin to remove the tiny offender. Firstly, make sure that your machine top thread tension is set to 00. You’ll find this in the Machine Settings section. Check your instruction book if you can’t find it. To check your tension frame up a piece of medium weight, non-stretch fabric with a tearaway backing with both items fully secured by the frame. 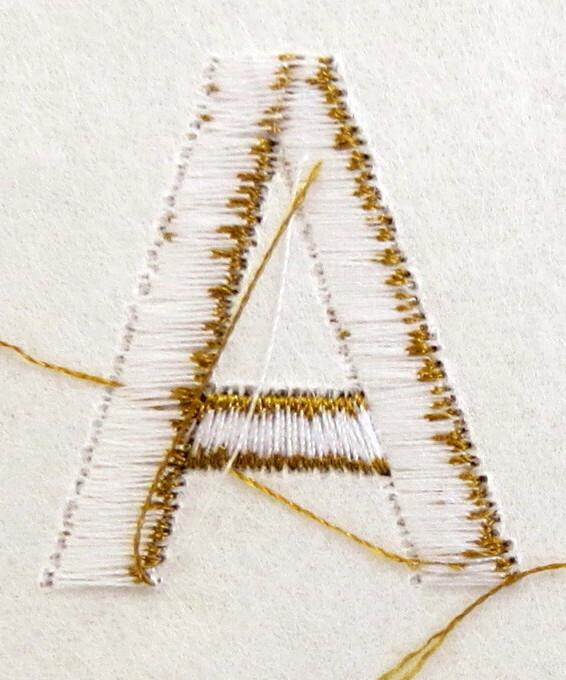 Choose the basic font in your machine, letter A, set for Large, and stitch your first letter in the top left of your frame. 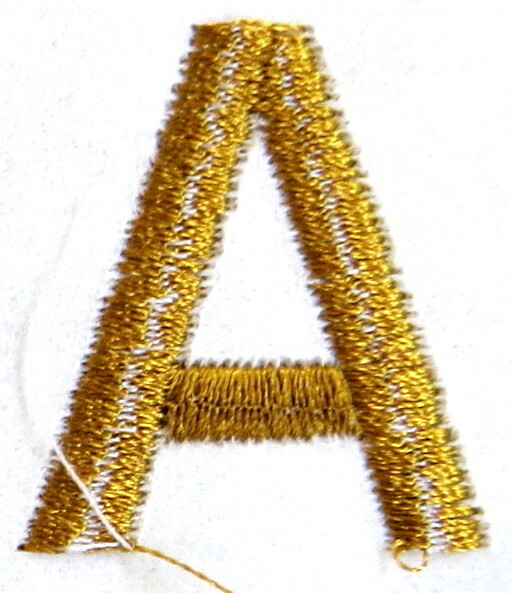 After stitching each letter remove the frame and check the underside. Too tight. Adjust the screw in quarter turns in an anti-clockwise direction to loosen it. Too loose. Adjust the screw in quarter turns in a clockwise direction to tighten it. Make your adjustments in stages until you have a balanced result as in the middle example. Dont force the screw at any point. If tension is too tight you are likely to experience excess puckering of the fabric around your embroideries. 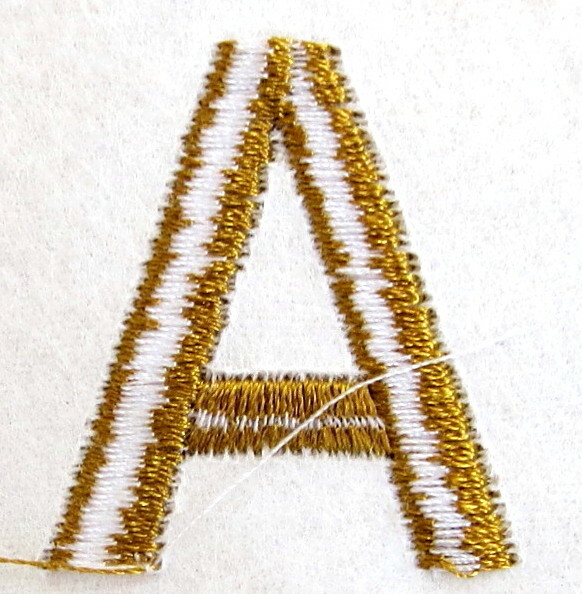 Too loose and your bobbin thread will show around the edges of your embroideries giving poor definition. Please understand that Keith Lord & Lords Sewing are not responsible for anything you undertake as a result of reading these articles and information guidelines. Open the PDF version of this information. Thank you so much for writing this blog, I was having problems on my brother pe 190d and I read on your blog about the spring and low and behold the was something in there, now I’m back to embroidery happiness. This post was invaluable to me. I really thought the top tension was my problem till I read this and found it was the bottom tension. The photographs were marvellous, I had something to follow. I had to tighten the little screw one and a half times round till I got it right. I will be seeing ‘A’s in my dreams, I sewed out 10, but it worked. I am wondering though why the bobbin case get so loose, and will it stay the way it is fixed now? Thankyou so much for this information it saved me a long journey!! PS Was it something I was doing wrong? Can I prevent it happening again? Hello Kate. You have a V3 machine and the bobbin case should stay in the position that you have now adjusted it to. I can’t say why it was out but at least you now know how to self-help with your machine tension. Keith. Hello David, The 955 is a sewing and embroidery model and uses the #60 type. Your 750 is an embroidery-only model and uses the #90 version. There is clarification in the description on our bobbin fill products on the website too. Regards, keith. Another BIG thank you for this post. I’d tried all sorts of cleaning and adjusting to no avail. Did the pin trick and of course it worked! Foreign bodies no longer lurk. And I learned that there is no need to remove the metal plate to get the bobbin case out! How much easier is that? I have just found your blog after having issues with the tension on my embroidery machine, and I just have to tell you it has fixed the problem instantly. Working with these machines everyday for my business, means I have already experienced a lot of problems, but this one had me stumped. I am so grateful for you writing this post, it has saved me alot of time and money, thank you. Oh and just so you know it was fluff under the tension spring! Keith you are a genius! Just got off the phone with you where you directed me to this blog and as you suggested I found a teeny tiny bit of fluff in the tension spring. All sorted now, thank you so much! I was convinced my machine would have to go in so am very happy. Thank you Keith for this information-I’ve been having a spot of bother with my tension so your blog has come in very handy.Not as good as having you close to come to, but helpful anyway. It would appear that you have been able to get yourself back to “embroidery happiness” Julia :). I appreciate you letting me know the blog has been useful. Keith. You make an excellent teacher Keith, what would we do without you. These PDF’s are so informative. I hope I have got my bobbin case in correct now, as I broke a needle yesterday and of course machine locked. Wish I had the info yesterday as My thread would not run smoothly through the cutting part, so took apart and did luckily your way this 2nd time not realizing plate must go on first. Thank you Keith for putting this together. As you know Keith I do not own a Brother machine. 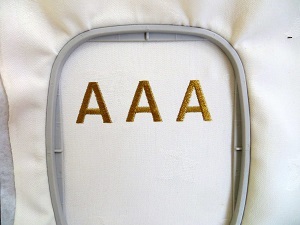 Having read this particular blog I have already found your illustrations of the embroidered A’s very useful. I am hopeless at tension issues but I now know how to check if my bobbin thread etc on the underside of a project is correct or not. Thanks. Thanks for your comments on various posts Maggie. Please be careful with your Husqvarna/Pfaff model because it can be tricky to get the balance right. Adjusting the bobbin case for embroidery could “throw out” your tension when you come to sew a straight stitch. You may be better to adjust the top tension on screen for the design or thread you’re using to get the right result and then you can easily put it back. Keith. I will Keith. Many thanks.